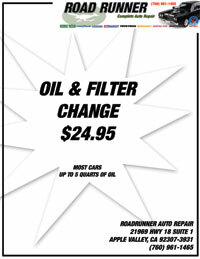 Either Conventional Oil or Synthetic oil our service Offers protection against deposit build up, viscosity break down and wear protection. After 30,000 miles, transmission fluid begins to show its age as it turns brown in color and oxidizes. It may be time for a flush. Regular engine tune-ups bring power and efficiency back to your car. We visually inspect your engine components and install new parts. Give us a call at 760-961-1465 or come by to set up an appointment. Get a quote on your auto repair or transmission service needed.